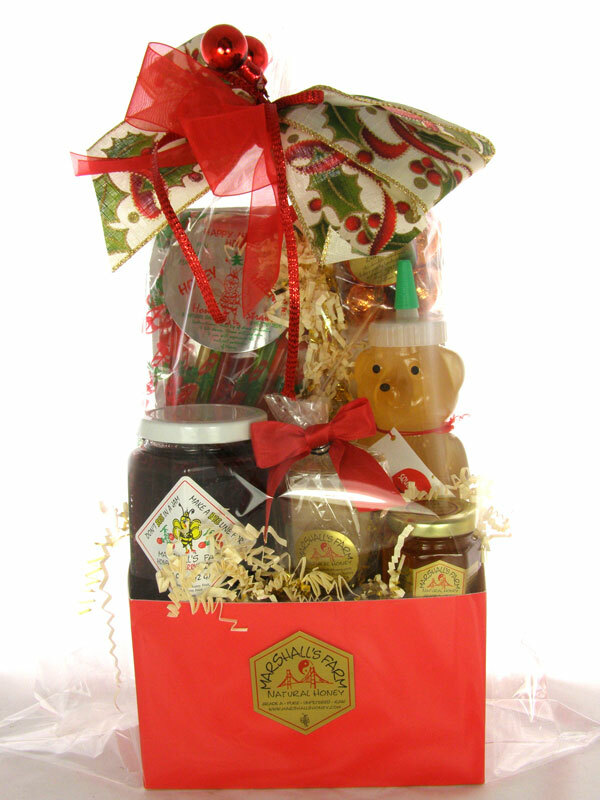 Give sweet, delicious treats for any occasion with honey gifts and baskets from Marshall’s Farm in California. We arrange unique gift baskets with a variety of sweet, salty, succulent flavors for birthdays, holidays, corporate gifts and more. Our gift baskets include our own 100% natural, organic honey blends harvested straight from the finest hives in California and across the West Coast. Our natural honey varieties are hand-bottled and represent the pure, untainted beauty of West Coast wildflowers with no additives, preservatives or manufacturing processes. Mix our delectable honeys with walnuts, almonds, apples and other fruit and nut combinations to make the perfect personalized flavor combo for any lucky recipient. Choose from an assortment of small and large gift baskets with whimsical or professional themes. Our products are naturally harvested and certified kosher to satisfy any taste or occasion. Find a unique gift basket in our product selections or add your signature with a custom gift basket.